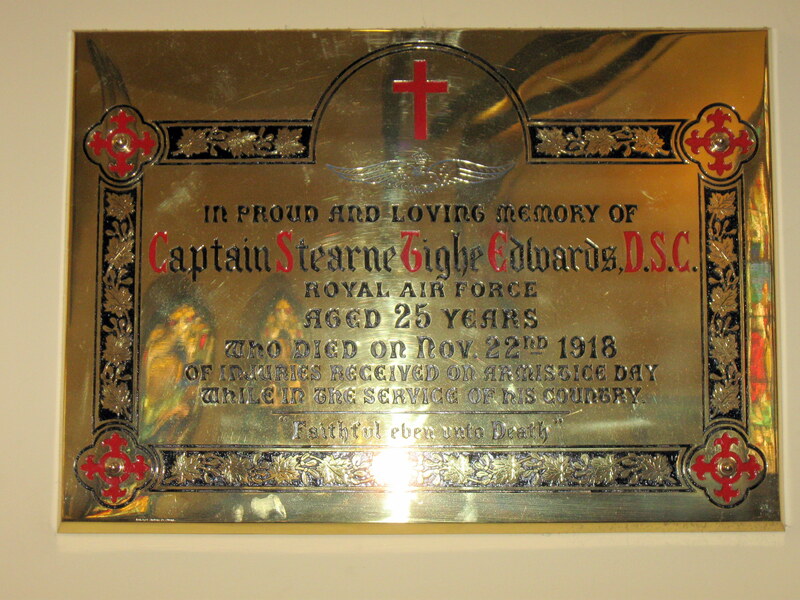 The following story of Captain Stearne Tighe Edwards was written by Dr. Greg Lodge, Yorkshire, UK., who contacted the library in Carleton Place a couple of weeks ago looking for more information, and especially a picture of the plaque dedicated to Stearne, which hangs in St. James Anglican Church. 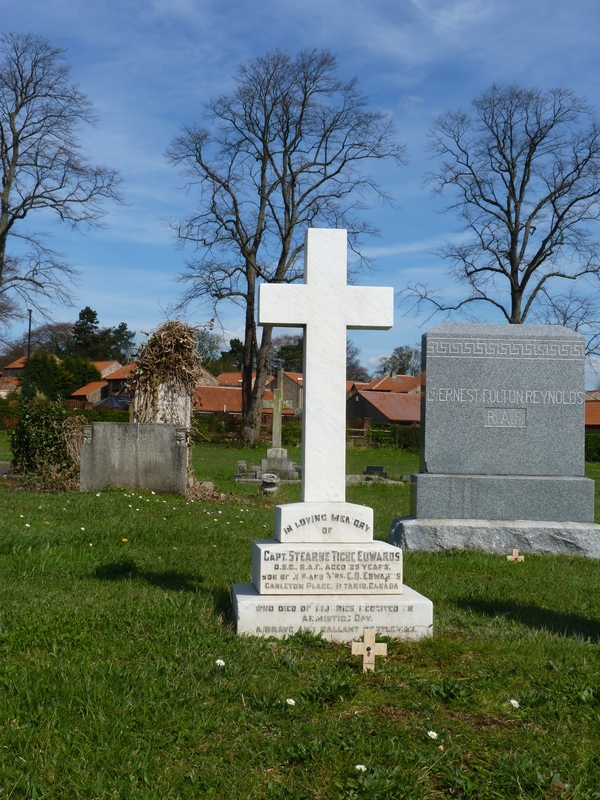 Dr. Lodge had just visited Stearne’s grave in Tadcaster, Yorkshire, and is busy trying to write up biographies of the WWI Canadian soldiers buried there. He very much hopes to contact anyone who may have more information about Stearne, and may be reached at: greglodge68@hotmail.com. I did manage to take a picture of the plaque, and have included it in this article, but hope someone may have a better picture that can be sent to Dr. Lodge. Some of the details of Captain Edwards’ life are from Larry Gray’s book, ‘We Are The Dead”, which he has used with Larry’s permission. “The various war memorials in and around Tadcaster bear witness to the courage of those who stepped forward to enlist when war threatened. 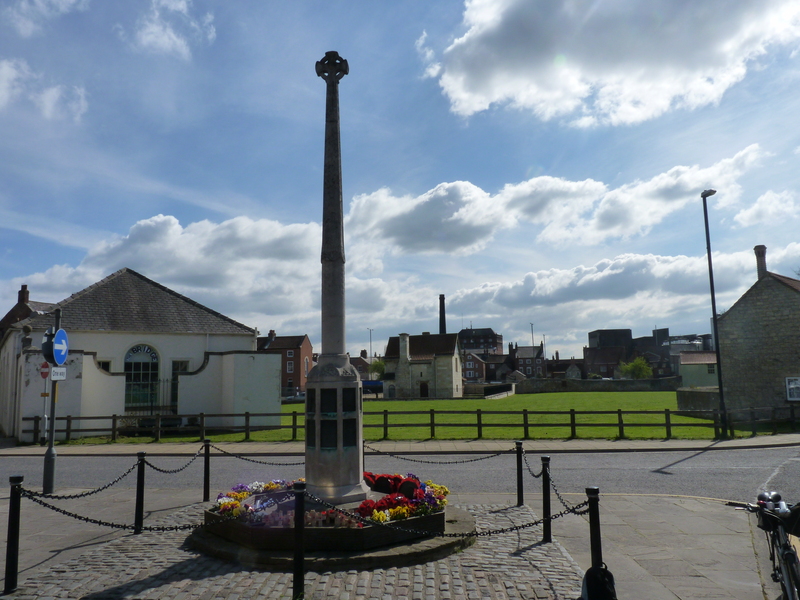 Look at the stories of those commemorated and it is clear that people of Tadcaster and villages did not hesitate – but the war heroes commemorated in Tadcaster came from much further afield. 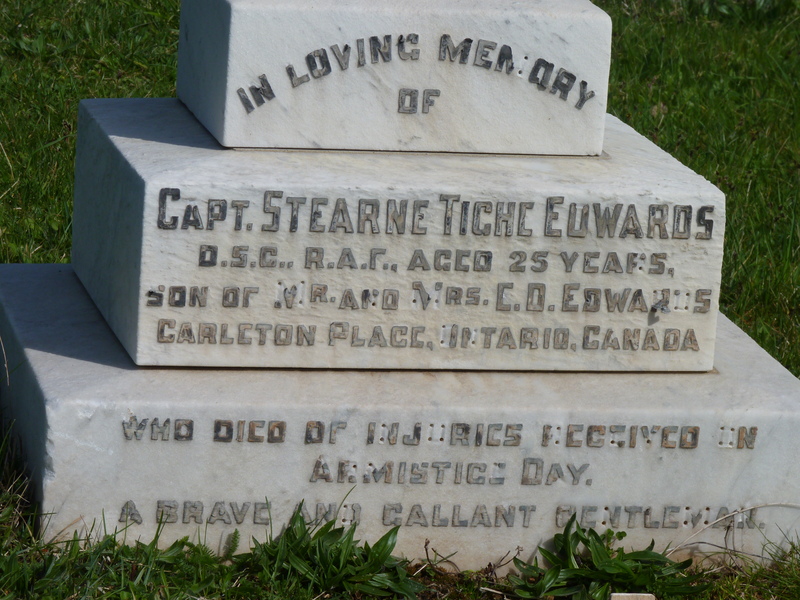 In the town cemetery there is a memorial to Captain Stearne Tighe Edwards – a Canadian air ace who came from Ontario to answer the empire’s call and who is laid to rest here. Captain Edwards was born in Franktown, Ontario, Canada in 1893. As a youth, he was self-reliant and quite serious for his age. He regularly attended church services with his family and was an outstanding athlete at school. He graduated with honours from high school in 1912 and became a civil engineer. At the start of the Great War Stearne Edwards was working at Port Nelson, Hudson Bay from where he supposedly walked 200 miles to a railway station to get a train bound for home to enlist for military service at the age of 21. He tried to enlist with the Royal Naval Air Service in Carleton Place, Ontario, in 1914, but the RNAS only accepted men who held a private pilot’s licence. His “RNAS Application from Civilian” on August 10, 1915, listed him as age 22, 5’11” tall and weighing 163 pounds. As the Curtiss School in Toronto, Ontario was full, he was accepted into the Wright Aviation School at Dayton, Ohio, USA in August, 1915. He obtained his licence – Aero Club of America Certificate Number 350 on 13 October, 1915. Though technically part of the Navy the RNAS was engaged in both fighter and bomber operations on the Western Front.Captain Edwards did both. Hetrained in Chingford and focused on the airborne art of bomb-dropping. He was very soon flying the new Sopwith One-and-a-Half Strutter with 5 Wing. The first operational flight entry in Stearne’s logbook is dated September 1, 1916. On October 12, he was part of a flight of sixty-one French and British aircraft from Luxieul and nearby fields which attacked the Mauser small arms factory at Oberndorf.In March 1917, he was posted to 11 Squadron (RNAS) to begin a new activity – as a fighter pilot. 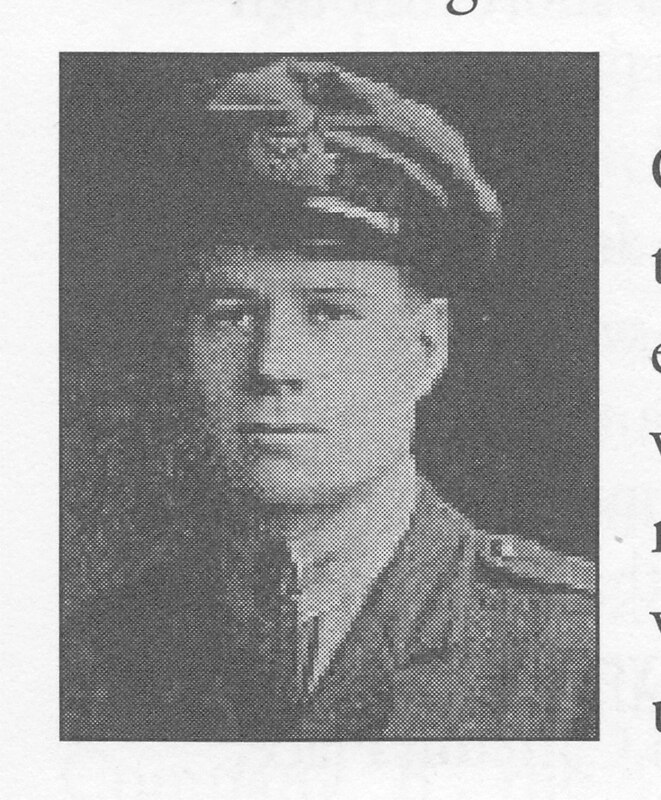 He trained on Nieuport Babys and then was posted to Naval 6 Squadron and then 9 (Naval) Squadron near Bray Dunnes in 1917 where he flew with his great friend F/Sub-Lt. Arthur Roy Brown. It must be said that Captain Edwards took little joy in his victories. Heregarded it as a job to be done and had a real horror of killing, even his so-called enemies. In his prayer book he once wrote a prayer asking forgiveness for taking the life an enemy, and for the safe return of himself and his men. For him, Christianity was a vital thing. His last commanding officer said of him that ‘he never judged a man by what he heard about him….he always took the part of the weak.’ Stearne Edwards had another claim to fame also. His best friend and fellow Canadian ace Arthur Roy Brown. Brown was so badly injured in a crash – the engine block of his plane smashed into his face in the crash – that he was placed in a temporary morgue to await burial. Edwards went to say goodbye but detected signs of life. Medics said he couldn’t be saved but Edwards wasn’t giving up on his friend and commandeered a motorcycle to get a civilian doctor from a nearby town. Brown survived and for many years was credited with making the most notorious “kill” of the war in shooting down the Red Baron – Count Manfred Von Richtofen. Edwards apparently acquired a piece of the Red Baron’s airplane which he sent home. It is almost impossible for us to appreciate the courage and commitment of these early young fliers. They were virtually making up the rules and pushing themselves and their machines to, and often beyond, endurance. War took its toll on Captain Edwards. On 30 January 1918 he became a flight commander but totally exhausted he eventually suffered a nervous breakdown in May 1918, which was directly attributed to his war service, and was hospitalized. He was recommended on May 24, 1918, by his squadron commander, for promotion to the rank of major. The justification was his exceptional performance in action against the enemy in the air. 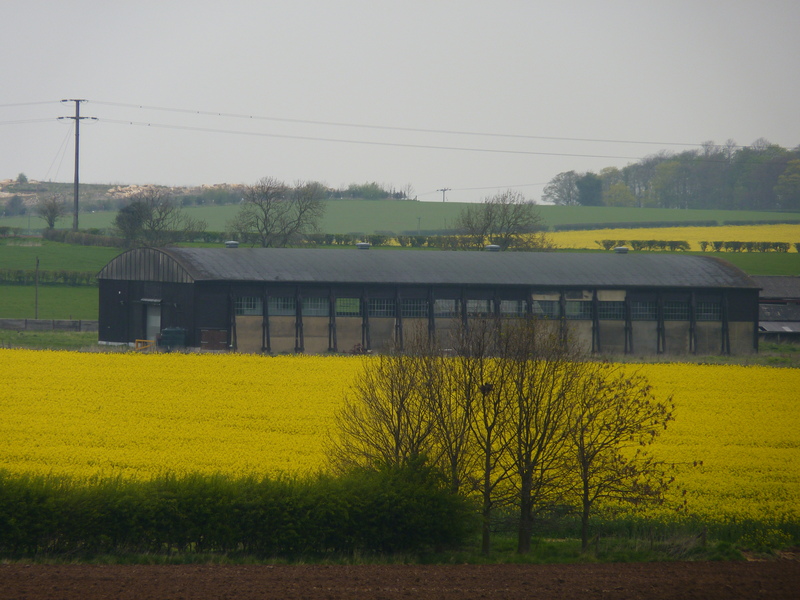 But his illness, and the bureaucratic slowness of the Air Ministry, precluded the implementation of the promotion.Following his recovery he became a flight instructor and was posted to RAF Tadcaster (previously known as RFC Braham Moor – there is still an original hangar on the site, see below) where he trained pilots in Number 38 Training Squadron – notably Americans who were now in the war but suffering heavy losses in the air over the Western Front – until Armistice ended the slaughter in Europe. This is where the tragedy of war reared its head. To celebrate the end of the war Captain Edwards – who had decided to apply for a permanent commission – took up a Sopwith Pup for a celebration flight. 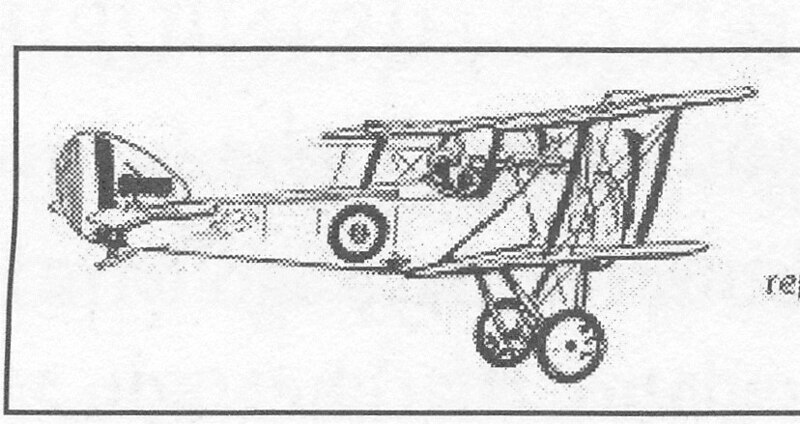 fig 3: Sopwith Pup in Flight. He is reported to have flown over the airfield in a victory roll but could not pull out of a dive, hit a wing tip on the ground and crashed. He was taken to hospital in York and lingered for ten more days. His best friend Roy Brown was there trying to do for Edwards what he had done earlier for Roy Brown – coax him back to life – but to no avail. After a leg was amputated the shock was too much and Captain Edwards died in the early hours of the morning at age 25 – already an “old man” of the RAF. His personal effects including a dog-eared Bible, poker chips and a photo of an unknown girl – maybe a Tadcaster girlfriend?- were returned to his mother. He was buried in Tadcaster – though the Carleton Place Herald reported news of Captain Edwards’ death in the edition of November 26, 1918 and suggested that efforts would be made to repatriate his remains – next to Flight Cadet Charles Theobald, another Canadian who died after crashing on a training flight in October 1918. In 1920 a plaque commemorating Captain Edwards was unveiled by Roy Brown at St James Anglican Church in Carleton Place, Ontario. The final words on the plaque were “Faithful even unto death”. Roy Brown was supposed to make a speech but simply cried at the loss of his best friend and the waste of war. Fig 5: Memorials to Captain Edwards and Flight Cadet Theobald. I am indebted for some details of Captain Edwards’ life to Larry Gray’s book, We Are The Dead, published by General Store Publishing House, Burnstown, Ontario, Canada, K0J 1G0, in 2000. ISBN: 1894263243. No 2 Company of the 42nd Regiment arrived home from Petawawa on Friday afternoon last, with Lieut. W. H. Hooper in command. The boys, while sunburned and travel-strained, moved with a regularity and precision which spoke well for the work of Col. Serg’t McDougall. The 42nd were personally congratulated in camp by H.R.H the Duke of Connaught on their excellent showing on the three days trip to Chalk River. Corporal Brown and Pte. Leakie qualified as two of the best shots in the regiment, while Serg’t Watson upheld the company’s good name in the sporting events. On arrival at their hall the company dispersed for the year, after cheers for their company, commander and also for Serg’t Major Henry.